Basketball is not just a sport. It is a science. While there may be a lot of athleticism and strategy involved with winning a game, a lot of math needs to be taken into account when it comes to actually shooting. You got to throw the ball at just the right velocity and at just the right angle so that it can bounce on and off the rim and/or backboard and straight into the basket. Don’t believe it? Then play Basketball Shoot to see why! You’ll shoot a wide variety of baskets in this handy little app. Physical aptitude and shooting technique won’t be needed, but you will need to be aware of the physics involved with shooting. Do you think you have what it takes to shoot beyond the three-point line? Get Basketball Shoot and find out! 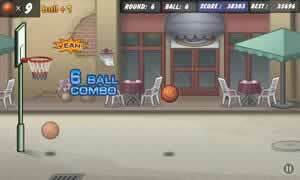 The object of Basketball Shoot can be found right there in the title. It may be as simple as that, but just like in real life, shooting a successful hoop can be a challenging process that requires a lot of practice to make perfect. 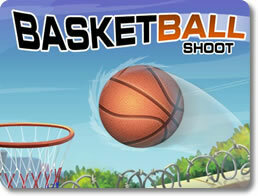 Shoot the ball by using simple and intuitive touchscreen controls. Pull back on the ball with your finger to determine the angle that you’re going to throw it at. Pull back farther to put more power behind it. Release your finger from the screen to throw. Look at the dotted line that appears to get a sense of what the ball’s trajectory will look like. Features realistic physics. The ball will believably bounce on the ground, rim and backboard. Learn how to use that bounce to your advantage in scoring good hoops. Basketball Shoot may be fundamentally easy to get a grip on, but it’s still a game of skill. Learn to shoot like a pro, and the app will reward you appropriately. You’re only allowed to miss 10 times before it’s game over. Shoot clean shots that don’t hit the rim or backboard. Doing so gets you even more points and grants you some extra misses. Rise to the challenge. Every level places you further and further away from the basket. Score consecutive shots to rack up a combo and multiply your points. As you play the game, you’ll earn many opportunities to change the look of Basketball Shoot once that old court starts to bore you. Shoot baskets in nearly a dozen different courts. Play in the city park, in an indoor gymnasium, on a tropical beach, or even in an airport. Unlock over 20 different balls with exotic designs printed on their surfaces. Shoot hoops with an enlarged baseball, or go absolutely crazy with a cyber-ball from the distant future! Basketball Shoot may sound a tad simple, but don’t let that fool you. Its accessible nature makes it all too easy to pick up and just about impossible to put down. Shoot a hoop or three and it’s all but guaranteed that you’ll be hooked immediately. 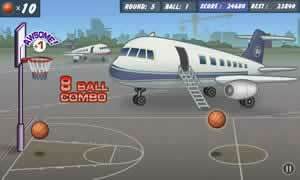 Get this game for your mobile device right now, and learn the science behind the basketball shot!